In the spirit of the Solstice-a-Longs, I present a three-night (or day) devotional for the coming Equinox. As with the Solstices, I am presenting information for both the Northern and Southern hemisphere. Once again, I am inspired by rites that were included in the Troth’s Book of Blots. The two rites are designed for larger groups; I have edited them for the candle-lighting theme that I used with the Solstice-a-longs. 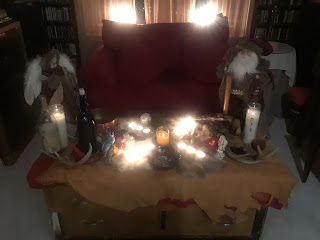 As there is no tradition for multi-day celebrations for the equinoxes as there is with Yule (at least that I can find), that simplifies things greatly. The first step is, obviously, to find what day the equinox is in your hemisphere. Keep in mind time zones may move the date, if the actual time of solstice falls near midnight. This year, in my time zone, the Equinox is Wednesday, March 20, 2019 at 5:58 pm EDT. Thus, the devotional begins on Tuesday, March 19, and ends on Thursday, March 22. A good site is http://www.timeanddate.com. Again, given both the source and also my own leadings, this is presented with a Norse theme, however, everyone is encouraged to be creative and apply their specific ideas to this, and I again invite folks to share it with me. In general, at both Equinoxes we will be honoring the transition of seasons. The equinox itself is a time of balance between day and night. One can think of it is also balancing of other energies as well as one works through the three days. Day 1: Thanking the energies/gods/spirits of the previous season. In the south, we would light a green and a yellow candle (or whatever you feel is appropriate) representing the fertility of the summer that is passing and for the harvest that is being brought in. Offerings of produce, bread, and mead could be appropriate here, and any early crops (which we don’t have here, yet). I plan on honoring Freyja and Freyr, as the Vanir, and gods of fertility and harvest (simplistically speaking). In the north, honoring those of the winter months who are yielding the cold season of rest and renewal. Offerings of vodka (because of association with northern lands), jerky, and other preserved items, representing the storage of food over the winter, are suggested in the blóts that inspired this. I would honor Ullr and Skadhi. Day 2: Thanking and honoring spirits of protection. There are usually many predictions of what the weather will be like for the coming season, be it hurricanes or blizzards. Thanking the spirit/god one sees as protecting either humanity in general or your own residence is appropriate. I personally would thank Thor for seeing me through the Summer (and Winter) and asking for his blessings and protection for the coming Winter (or Summer), with ale and porridge for an offering. Day 3: Asking for blessings for the season to come, and just flip the offerings and spirits suggested above. In the south, honoring the deities or spirits that symbolize the rest and reflection of the winter, and the blessings of renewal it can bring. For the northern hemisphere, asking for the blessings of the coming season of planting, growth, and eventual harvest. May the blessings of the Ever Changing Sun be yours. I was going to do it all again in June for Midsummer, a mere 6 months away rather than a whole year. My philosophy, based on nothing more than a hunch, is that long-term readings are only for about 6 months into the future. There's just too much other stuff out there that can impact the energies for me to feel comfortable going out any further than that. As with everything, others' mileages may vary. Therefore, each night was still a rune pull, but the pairs of runes will go through the first half the year. One last caveat, I also believe that all runes are in play at all times, but that at certain times, some move to the forefront. The new year starts off with extra fire and energy, and perhaps a little extra in our wallets, too. Fehu's abundance extends beyond the financial though, and our creative juices should be flowing, brimming with new ideas, new directions, and new plans. Ehwaz is a rune of partnership, one where it's necessary to be clear who is the horse and who is the rider, and so it's possible that in bringing the energies of Fehu into action, you may need to either take the reigns, so to speak, or perhaps listen to the commands of the rider in guiding you to the best place to focus. Ansuz is the rune of Odin, and also of communication and travel. To continue the theme, it may be necessary to go outside normal channels to get your goal moving ahead. Whether that means a new geographic location, new Internet presence, whatever... February is when to do it. But recall that you get out of anything what you put into, and Jera reminds us that if we don't follow through, we won't get the rewards we want. Perthro and Mannaz both speak to the importance of community, both on the individual level (mannaz) and en masse (perthro). Our ancestors were communally-focused, and whatever idea you have that you're working on, taking it to the community is important. Maybe you need to get feedback for approval, or maybe you need to get additional information to keep going forward. Sometimes our projects need to be seen to be completed (as in art or music). Whatever it is, seek input from your community at this time. Raidho is the journey and the wheel of the wagon. Thurisaz can be an obstacle that is not insurmountable, but must be handled with care so that one doesn't get pricked by the thorns. Keep going on your project or endeavor, but understand there will be bumps in the road. A sure hand on the reigns can maneuver the wagon around and over these bumps safely, but only if you're alert and paying attention. We continue the theme of effort that is implied in April. Naudhiz is the bow drill and you can rekindle the flames from Fehu in January, but only if you work at it. There's a saying that nothing worthwhile comes without effort. I am on the bubble as to how true that saying is, but I do know I am much more successful when I actually work on things as opposed to letting them happen organically. Maybe you are too? The energy of Algiz offers us protection and safety, both in life in general, and to approach deity or spirit for guidance. Perhaps a little divine inspiration can give you the push you need, or even help take up the work if needed. As we head into Midsummer, we reach to runes that kind of contradict each other. Othala refers to land, ancestral wealth, and the stability of being in that space. Hagalaz, is the very antithesis of unstable, with its very sudden, abrupt, and unavoidable change. With these two juxtaposed in the same month, June is a time when the boundaries of Othala are shaken up. Whether you do the shaking yourself or let it happen is up to you, but either way ... forewarned is forearmed, so get ready for things to get rocky, but always remember. The hailstone clears away that which is no longer needed and then melts into the earth. With a little agency on your park, maybe you can direct the hailstorm to the things you decide you don't need anymore. 12/31: Good Day! And Welcome to Day 12! Twelfth night! New Year’s Eve! Traditional parties work well here, but a more spiritual aspect can be observed either quickly at home or as part of the party! Activities include divination (so placement of runes or other divination tools on the altar). There’s also a suggestion I quite like from the Matthews’ book to gather juniper (if it wasn’t gathered on Day 9) and letting it dry by the fire (or wherever that is in a modern home) for use to bless the home tomorrow. In addition, we burn the yule log, wreath, or whatever, at midnight as we ring in the new year (weather permitting). While it is New Year’s in the South, also, one could celebrate Twelfth Day, with a picnic or other similar activities. The next day, January 1. Take down all the stuff and cleanse the residence by aspersing with the greenery from day 9 using melted snow or rain from day 8! I thank you for joining me in this rite, and hopefully the offerings given, and the blessings received flow out from us all, to bless the entire world. 12/30: Good Day! And Welcome to Day 11! We are almost there! As we prepare to return, we give one last nod to the spirits of the other world. We honored the Winter Wanderer and the Green Man at the beginning, so today we will honor those other-worldly “nature” spirits, who can move between the worlds, and who watch over us as we depart sacred time. The late Alexei Kondratiev, in his book “The Apple Branch,” has a whole thing about the Cosmic Boar Hunt that sends the Boar into the land/underworld in the dark half of the year, and out of it at Beltainne, where he is replaced by the Stag. The role of the boar in Christmas and winter activities can be seen in “The Boar’s Head Carol,” and the importance of the boar’s head to St. Stephen’s Day festivities, is believed to be an echo of an earlier offering to Ing (Freyr). So this night in the north, we honor the boar, and the promise of abundance to come. I place a boar carving on the altar and offer an apple for the Great Boar. That leaves the Stag, as Kondratiev’s counterpart to the boar. There is a lot of important mythology of the importance of stags, or deer in general (and it is interesting that Freyr ends up using an antler to defend himself). They can be associated with protection and kingship, and thus the value of integrity. I place antlers on the altar and offer corn for the Great Stag. 12/29: Good Day! And Welcome to Day 10! We are almost at the end, and as such, we need to make preparations to return to the more mundane world. In the Matthews’ book, they talk about St. Distaff’s day, which is the first day after the Twelve Days of Christmas (usually the day after Epiphany) when women were permitted to return to their spinning. As we prepare to return, we can place a symbol of our work on the altar, and honor those deities or spirits associated with that. I tend to put my drop spindle on the altar, since not only will we be returning to work, we will be returning the house to its more mundane rhythms as well. 12/28: Good Day! And Welcome to Day 9! On Day 9, we celebrate the green growing things of the season. For the north, we honor the evergreen, that stays green even as the rest of the world appears to die. We can honor and meditate (or even journey) on the world tree, placing a sprig of real evergreen on the altar, preferably juniper as that was used like sage for cleansing in northern Europe. In the south, we can honor the deciduous trees that will lose their leaves and go dormant six months from now. We can also honor the herbs and flowers that are at their peak, and place sprigs of herbs or flowers on the altar. 12/27: Good Day! And Welcome to Day 8! On Day 8 we celebrate the all-important precipitation on which we all depend. In the North, honoring winter and snow, and deities associated with that. I have a snowflake ornament I place on the altar, and if I’m lucky, I can get a bowl of snow! In a pinch, ice cubes could work, too. In the south, we can celebrate rain and storms, and any deities associated with them. One could place an umbrella next to the altar, and again, maybe a bowl of rain water (or just from the tap)! The Plant Spirit Ally Challenge is Coming Soon!